LA JOLLA—Many neurological disorders—Alzheimer’s, schizophrenia, autism, even depression—have lagged behind in new therapies. Because the brain is so complex, it can be difficult to discover new drugs and even when a drug is promising in animal models, it often doesn’t work for humans. Scientists from the Salk Institute report a new approach that can develop more sophisticated organoid models by ensuring they receive sufficient oxygen and other nutrients via transplantation into rodents. 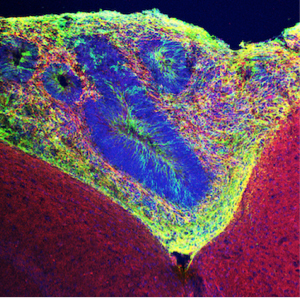 The work, published in Nature Biotechnology on April 16, 2018, could yield insights into the development of cures for brain disorders; speed up the testing of drugs; and even pave the way for someday transplanting healthy populations of human cells into people’s brains to replace damaged or dysfunctional tissue. Human organoid tissue (green) grafted into mouse tissue. Neurons are labeled with red. From left: Sarah Fernandes, Daphne Quang, Stephen Johnston, Sarah Parylak, Rusty Gage, Abed AlFattah Mansour, Hao Li. 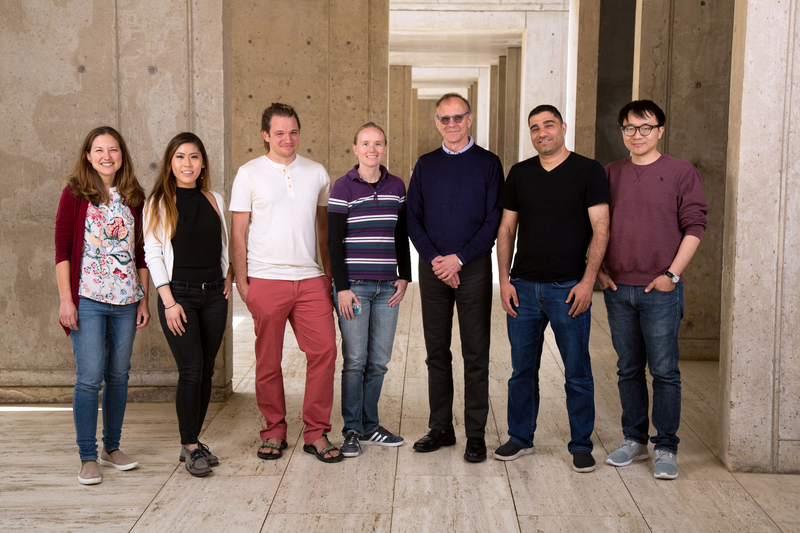 Other authors included: J. Tiago Gonçalves, formerly of Salk and now at Albert Einstein College of Medicine; and Cooper W. Bloyd, Hao Li, Sarah Fernandes, Daphne Quang, Stephen Johnston, Sarah L. Parylak and Xin Jin of Salk. The work was funded by the National Institutes of Health (U19 MH106434, U01 MH106882), The Paul G. Allen Family Foundation, Bob and Mary Jane Engman, The Leona M. and Harry B. Helmsley Charitable Trust Grant (2012-PG-MED), Annette C. Merle-Smith, The G. Harold and Leila Y. Mathers Foundation, JPB Foundation, Dolby Family Ventures and NIH grants (R01NS083815, R01AG047669), the CIRM Bridges to Stem Cell Research Internship Program, an EMBO Postdoctoral Long-term Fellowship (ALTF 1214-2014/European Commission FP7-Marie Curie Actions, LTFCOFUND2013 and GA-2013-609409) and the Human Frontiers Science Program (HFSP Long-Term Fellowship—LT001074/2015).